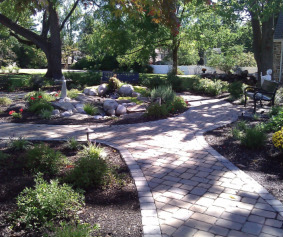 Our Memorial Garden is located between the church and rectory and is our gift to a world filled with stress. All are welcome to stop by from dawn dusk to reflect, relax or read. We hope that many will find peace and renewal when they visit. Our garden became a reality after Charlotte Modi, a beautiful one year old child, lost her fight to cancer in November 2009. 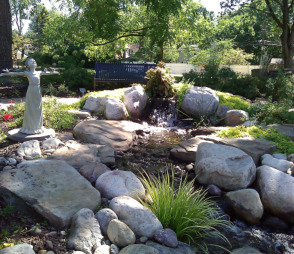 In thanksgiving for the love and support of the congregation, Charlotte's family offered a donation to formalize the plan for a memorial garden. The captivating water feature was dedicated to the memory of Charlotte. The garden is also open for the internment or scattering of the ashes of loved ones. Call our church office (610-941-6666) for more information regarding burials or memorials.